1. A man can cross a downstream river by steamer in 60 minutes and same by boat in 80 minutes. 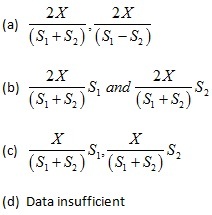 If the time of crossing the river in upstream direction by steamer is 70% more than downstream time by the steamer and the time required by boat to cross the same river by boat in upstream is 70% more than the time required in downstream by boat. What is the time taken for the man to cross the river downstream by steamer and then return to same place by boat half the way and by steamer the rest of the way? 2. A person fired two shots from a building at an interval of 144 seconds. A bear separating too fast hears the two shots at an interval of 162 seconds. 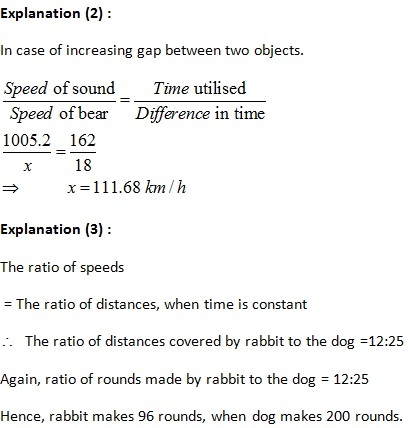 If the velocity of the sounds is 1005.2 km/h, then find the speed of bear? 3. There were a rabbit and a dog walking in the two different rings of same radii. There is a person observed that when rabbit moved 3 steps, dog moved 5 steps in the same time, but the distance traversed by rabbit in 5 steps is equal to be distance traversed by dog in 4 steps. What is the number of rounds that a rabbit made when dog completed 200 rounds? 4. 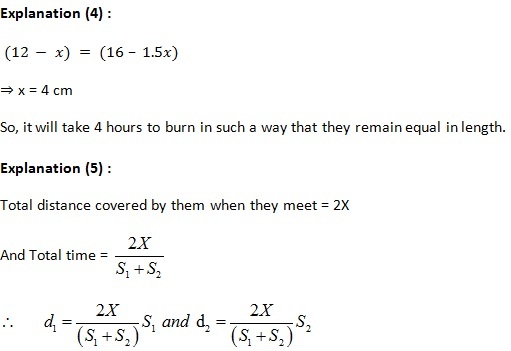 A candle of 12 cm long burns at the rate of 10 cm in 10 h and another candle of 16 cm long burns at the rate of 12 cm in 8 h. What is the time required by each candle to remain of equal lengths after burning for some hours, when they start to burn simultaneously with uniform rate of burning? 5.Two boats start at the same instant to cross a river X metre wide. The faster boat reaches the other bank and returns back immediately. What are the distances travelled by them when they meet, where the speeds of these boats are S1 & S2? 6. A criminal escaped from the jail and run at the speed of 45 km /hr. The police start chasing him in the same direction at the speed of 60 km/hr. The police had a dog, which could run at 70 km/hr. The dog would run to the thief and then return back to the police and then back to thief. It kept on doing so till the police caught the thief. Find the total distance travelled by the dog in the direction of the thief? 7. Without stoppage, a train travels a distance of 120 km in 2 hours. and with stoppage it covers the same distance with an average speed of 40Km/hr. On an average, how many minutes per hour does the train stop during the journey? 8. A journey of 384 km takes 2 hours less by a fast train than by a slow train. 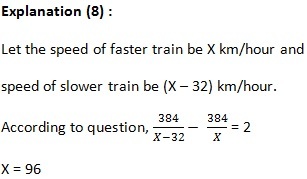 If the average speed of the slow train is 32 kmph less than that of a fast train, what is average speed of the fast train? 9. 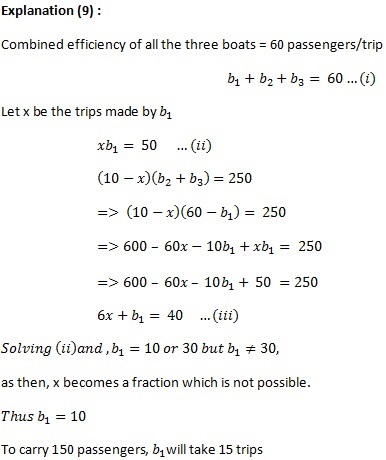 Three boats B1, B2 and B3 working together carry 60 people in one trip. One day an early morning B1 carried 50 people in few trips alone. When it stopped carrying the passengers B2 and B3 started carrying the people together. It took a total of 10 trips to carry 300 people by B1, B2 and B3. How many trips it would take to B1 to carry 150 passengers alone? 10. Two athletes left Gurgaon for Agra simultaneously. The first athlete stopped 42 min later when he was 1 km short of Agra and the other one stopped 52 min later when he was 2 km short of Agra. If the first athlete jogged as many kilometers as the second and the second as many kilometers as the first, the first one would need 17 min less than the second. Find the distance between Gurgaon and Agra. Then return back and continue till the criminal caught. So we cannot calculate the distance covered by the dog. Average speed of the train = 60 km/hr means it speed per minute = 1 km. With stoppage it covers the same distance with an average speed of 40Km/hr means it travel only for 40 minutes. The train stops for 20 minutes per hour during the journey. Athlete would run at 4 min per km. In the new condition, the first athlete would jog for 13 km while the second athlete would jog for 14 km and their respective times would be 39 mins and 56 minutes. This is consistent with the condition in the question which talks about a difference of 17 minutes in their respective times.